The Wirksworth Stone, Derbyshire (Drawing by J. Romilly Allen, c 1889). OS grid reference: SK 2874 5394. Near to the centre of the town of Wirksworth, Derbyshire, along St Mary’s Gate stands the ancient parish church of St Mary the Virgin, and housed within is the Anglo-Saxon ‘Wirksworth Stone’, a richly carved sculptured stone with biblical scenes and figures, which is said to date from the 7th-9th century AD; and there is also a stone with a ‘rare’ example of an Anglo-Saxon lead-miner carved onto it, dating from the 8th century? The ancient parish church of St Mary, dating largerly from the 13-14th centuries, is located some 25 metres south of the B5035 (Wirksworth Moor road) on St Mary’s Gate, close to the centre of the town. The villages of Cromford and Bonsall lie a couple of miles to the north on the B5036 road. The Wirksworth Stone is built into the north wall of the nave and is oblong-shaped and chunky; it measures 5 feet x 3 feet but is probably not as long as it originally was (as can be seen at the western edge) – due to damage over the centuries. 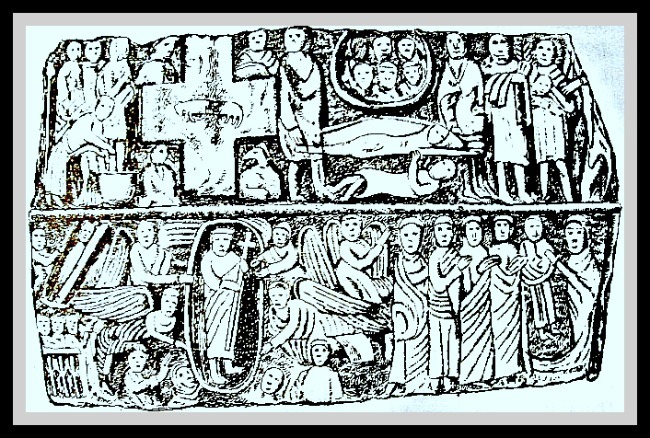 This richly sculptured stone-slab, which is in fact a coffin lid [from a sarcophagus], is adorned with scenes and figures from the Bible, most of which depict the ‘Life of Christ’. There are numerous angels, apostles, disciples and members of the holy family. Yet these figures look ‘almost’ as if they had been carved yesterday! They were probably carved in 800 AD. The stone was discovered lying upside-down beneath the chancel floor, quite close to the altar, in 1820. The first church on this site was apparently founded by the Northumbrian monk and missionary, St Betti, in c 653 AD. So, could the sculptured stone be from his tomb? The author Derek Bryce in his antiquarian book ‘Symbolism of the Celtic Cross’ says that: “In Britain there is a unique instance of the Lamb of God on a cross, on a sculptured slab in Wirksworth Church, Derbyshire.” The said ‘Lamb of God’ is depicted on a rather thick cross on the top tier of the slab – with three creatures and a human figure surrounding it. Carving of lead miner, St Mary’s, Wirksworth, Derbys. Also inside St Mary’s, in the wall of the south transept, is a fragment of stone from maybe the 8th century AD, which has a carving of a lead-miner upon it. 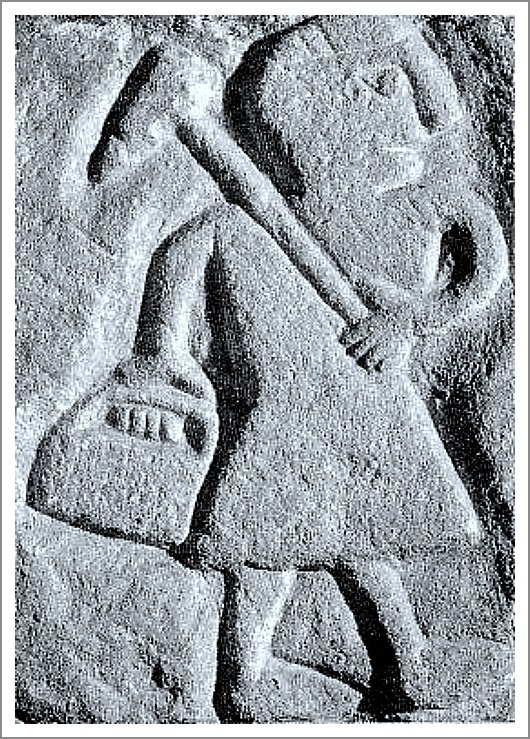 This little figure is locally called T’owd Man of Bonsall or just ‘Owd Man’ and is thought to have come from Bonsall church near Cromford in 1876 – the two Derbyshire villages lie a few miles north of Wirksworth. The area around here has always been known for its lead mines, indeed the Romans are ‘said’ to have mined the stuff. In the early 19th century lead had then become such a sellable commodity that a “moot” hall was established in Wirksworth. Jenkins, Simon., England’s Thousand Best Churches, Penguin Books Ltd., London, 2000. Rodgers, Frank., Curiosities of Derbyshire And The Peak District, Derbyshire Countryside Ltd., Derby, 2000. Romilly Allen J., Christian Symbolism in Great Britain and Ireland before the 13th Century, 1889. Categories: Ancient Churches / Chapels, Sculptured Stone, St Mary's Church | Tags: The Wirksworth Stone in St Mary's Church at Wirksworth in Derbyshire | Permalink.